Findings come from study that involved participants jumping out of planes. Chronic psycho social and emotional stress has well–documented negative effects upon the human immune system, measurably increasing the risk of disease. 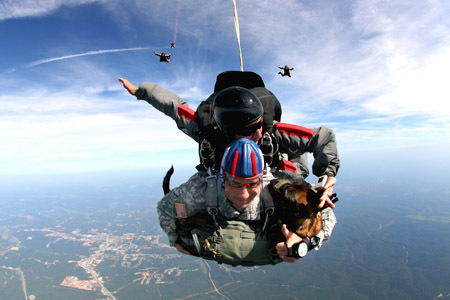 Much less is known about the health effects of acute but transitory episodes of stress, such as jumping out of an airplane. Do these panic–inducing moments also raise the risk of stress–related conditions and disorders, such as cardiovascular disease, sleep dysfunction, impaired wound healing, depression and obesity? A team of researchers at University of California, San Diego School of Medicine, Stony Brook University in New York and elsewhere addressed that question by asking study participants to literally jump out of a plane, taking blood samples before and after to measure key immune response indicators. Their findings are published in the March 4 issue of Brain, Behavior and Immunity. The novelty of the study, said Rana, is leveraging advanced computational and molecular tools to assess large–scale immune system responses, to more finely detail the effects of acute, short–term stress. Chronic psychosocial and emotional stress has well-documented negative effects upon the human immune system, measurably increasing the risk of disease. Much less is known about the health effects of acute but transitory episodes of stress, such as jumping out of an airplane. Do these panic-inducing moments also raise the risk of stress-related conditions and disorders, such as cardiovascular disease, sleep dysfunction, impaired wound healing, depression and obesity? A team of researchers at University of California, San Diego School of Medicine, Stony Brook University in New York and elsewhere addressed that question by asking study participants to literally jump out of a plane, taking blood samples before and after to measure key immune response indicators. Their findings are published in the March 4 issue of Brain, Behavior and Immunity. Researchers tested first-time, tandem skydivers to measure key immune response indicators. The study involved 39 individuals (24 males, 15 females) who had independently contacted a New York-area skydiving school to schedule a first-time tandem sky dive in which the student skydiver was connected by harness to an instructor who guided the student through the jump, freefall and landing. All of the participants were healthy adults with no history of cardiac or mental illness. They were divided into two groups: 13 would have their RNA expression profiles measured to understand molecular signatures associated with stress, and 26 would be studied by flow cytometry to access changes in immune cell composition in blood. Blood sampling was precisely scheduled by the lab of co-author Lilianne R. Mujica-Parodi, PhD, associate professor in the Department of Biomedical Engineering at Stony Brook University. Participants provided a baseline blood sample at 9:15 a.m. within one week prior to or one day after the sky dive. On the day of the skydive, all participants awoke at 6:30 a.m. and arrived at Stony Brook University Hospital at 7:30 a.m. where “pre-boarding” samples were collected at 9:15 a.m., one hour before take-off. The actual jump occurred at 10:30 a.m., when the airplane reached an altitude of 11,550 feet. Skydivers landed five minutes later, with post-landing samples taken at 10:45 a.m. and again at 11:30 a.m. back at the hospital. In addition, saliva samples were collected every 15 minutes from 9:15 a.m. to 11:30 a.m. on both the day of the sky dive and the baseline hospital day. Previous research has shown that acute, short-term stress provokes a mixed bag of immune responses, some beneficial, some not. For example, numbers of natural killer cells, which are part of the innate immune response, increase, but skin healing capacity is reduced. The novelty of the study, said Rana, is leveraging advanced computational and molecular tools to assess large-scale immune system responses, to more finely detail the effects of acute, short-term stress. Interestingly, the researchers noted that modules of coordinately expressed genes responding to stress were different between male and female skydivers, which they say may help explain gender differences observed in development of stress related cardiovascular and autoimmune disorders, as well as conditions like post-traumatic stress disorder (which is twice as common in women). Nadejda Beliakova-Bethell, PhD, first co-author of the study and an assistant project scientist at UC San Diego, with background in infectious diseases, said while the research was exploratory, it laid the foundation for future, more detailed experiments to elucidate the contribution of stressful life events and exposure to pathogens to the functioning of the immune system. “The immune response to stress is similar to the response to pathogens,” said Beliakova-Bethell. “An instance of an acute stress or infection activates the immune system, while chronic stress or infection results in the exhaustion of the immune system, making it less effective at responding to new stressful events or new pathogens. The effects on the transcriptome of white blood cells, observed in this study, were very transient, returning to baseline levels within one hour after landing, but with repeated acute or chronic stress, these transcriptomic changes would be expected to be more permanent, and may be similar, at least in part, to the effects of chronic viral infection. Co-authors include Michael S. Breen and Christopher H. Woelk, University of Southampton, UK; Joshua M. Carlson, Northern Michigan University; and Wayne Y. Ensign, Space and Naval Warfare Systems Center, San Diego. Funding and support for this research came, in part, from National Institutes of Health (grants 5MO1-RR-10710, AG035031 and 2T32AI007384-21A1), the Office of Naval Research Stress Physiology and Biophysics Program (grant N00014-19-1-0351; UC San Diego #27283A); VA Center of Excellence for Stress and Mental Health; Center for AIDS Research at UC San Diego (grant AI36214), the San Diego Veterans Medical Research Foundation, the Pendleton Charitable Trust and the Department of Veterans Affairs, Veterans Health Administration, Office of Research and Development. Posted on July 4, 2016, in Uncategorized. Bookmark the permalink. Leave a comment.